In the fall, St. Ignatius girls in fifth through eighth grade participate in volleyball. Fifth through eighth grade boys play volleyball each spring. Girls JV Volleyball PAL Champions! 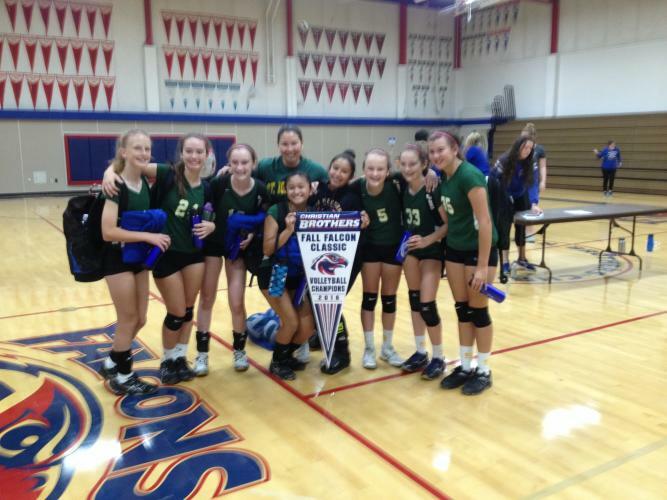 Congratulations to the JV Girls Green Volleyball team for winning the PAL Championship! The team defeated St. John Notre Dame in the championship game in three sets. The team went undefeated in league play this season. Congratulations to our 2017 Varsity Girls Volleyball Team! Congratulations to our S.I. Volleyball Teams! Congratulations to the 2017 Varsity Girls Rec Volleyball team for placing 3rd in the St. John Notre Dame end of season tournament. Congratulations to the 2017 Varsity Boys Volleyball team for finishing as the runner-up in the PAL Championship! Boys team came in 2nd in the St. Patrick’s tournament. Boys Varsity team placed 4th in the Christian Brother Spring Classic tournament. New SI logowear! Check out the new Webstore! St. Ignatius new logowear items now offered through our new webstore! Come to the office to check out samples of all of the items offered. Please note: these items are NOT uniform approved. SI Athletics will receive a portion of every sale through this exclusive webstore. Many items available for adults including hats, jackets, polo shirts, sweatpants and so many more! All sales are online. Grey and green uniform approved sweatshirts are still available for purchase in the office. The SI Medical Release form needs to be completed by the student’s physician after June 15th of the school year in which your student will be participating in a sport for St. Ignatius. Once completed and turned into the office, the Medical Release form is valid for the entire school year. Emergency contact forms are due to each Coach either at tryouts or by the first practice.